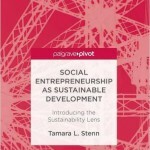 Day 26 – the wisdom of development. 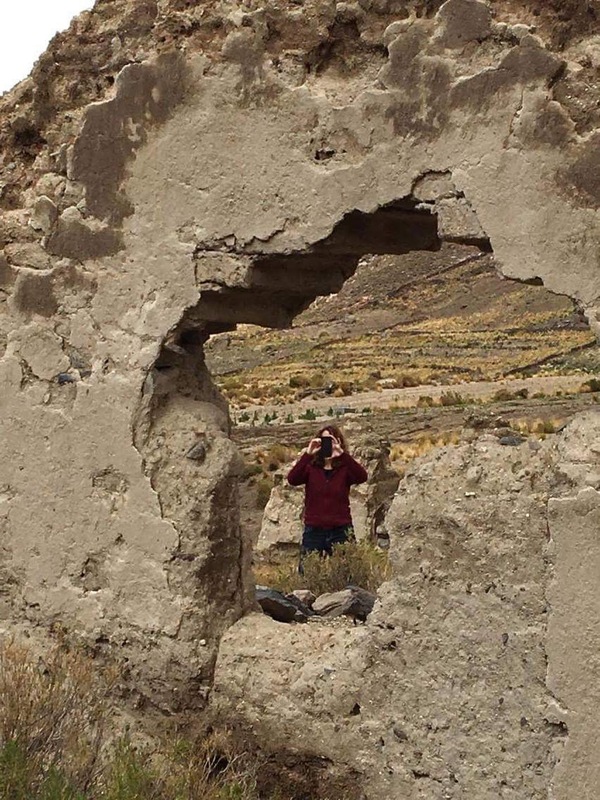 Driving back to Oruro from Curahuara, two hours away, I was able to have an open conversation with Carlos ___ Director of ___. For 20 years he has been working in development. He seems one of the biggest challenges being the rural people’s general conservatism and fear of change. Though he hosted countless workshops teaching genetics and animal husbandry to llama herders, they continue to purchase lesser quality llamas in the markets to sell once they mature after a few years. The farmers stay the same, repeating traditions they have had for centuries without incorporating new knowledge. It reminded me of the farmers I had known 15 years ago, when working as a rural journalist. In some ways this resistant to changes was good, it enabled farmers to avoid misdirected development schemes that ended up being costly in time and money and not working as they were proposed but at the same time they left behind things that could have been helpful. In the quinoa fields there was a chemical fertilizer project offered by USAID years ago, an INIAF engineer explained to me, it left the soils burnt and unable to sustain life. The dry, arid climate and low levels of organic matter, turned the fertilizers into poison instead of food. Some development projects did not end so drastically but did end being different than what they started out to be. Rural sanitation never fared well when latrines were offered – traditionally people in the altiplano would use the vast open plains as their fresh air bathroom. The sun quickly drying their feces and the vastness of the area causing no real bacterial illnesses to accumulate. However foreign development workers saw that as dirty and spent hundreds of thousands of dollars building thousands of latrines across the countryside and teaching people about hygiene. After a few months of use, explained APQUISA member and former development worker, Ecebio Calani, the latrines were dirty, smelly, filthy places to be. So the families simply covered up the hole and used the structure as a storage shed. Much more practical! Calani explained there was another development project to help the challenge of finding drinking water in the desert by creating rainwater capture systems going from roofs to rain barrels like those used in Bermuda. This was developed in Rodeo, a small rural town in the department of Oruro. Because of the sparseness of rain and the prevalence of dust and wind, the water that did trickle down from the dirty roofs was dirty and undrinkable. So the people of Rodeo instead turned the water capture systems into an irrigation system for greenhouses. I visited those greenhouses and there were working very well. Now large covered cement cisterns replace the small rain barrels. On the theme of development, Carlos lamented on the backwardness of it all. 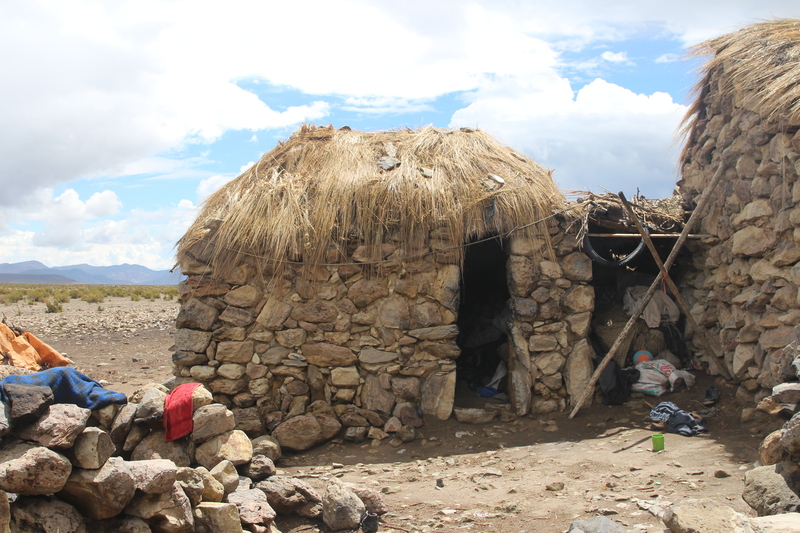 For example in the large commercial town of Challapata (were much of the inter-salar quinoa is sold – but not grown) people choose to have houses and live there full time – however their livelihood is in the rural countryside. So they live in Challapata and send their children to school there. At 8am they leave for their rural community – taking public transportation and walking. Arriving at their small farms around 10am. The spend the day doing farm chores, milking and grazing a handful of sheep and cows, tending crops such as potatoes, fava beans, wheat, processing harvested food for long term storage – for example making chuno potatoes, or cleaning quinoa, or irrigating fields with gravity fed water systems. They return home around 6pm. Meanwhile, the schoolchildren have been home alone in the town since school let out for lunch, ending around 1pm. They sit around playing computer games and watching TV, or wandering around town with their friends waiting for their parents to come home. Carlos’ question is why is it not reversed? Why don’t the parents use the house in Challapata for selling products in town over the weekend and attending the market and live full time in the farmhouse, taking their children to school in the morning and having them come home to the farm in the afternoon. That way the children are in the fresh air, learning to farm, helping the family and living a more healthy life. This, living a dignified life in the country, with full access to all modern amenities such as electricity, transportation, and schools is what Carlos calls, “Vivir Bien.” He gets frustrated when he sees people living this in reverse. It makes me think of my own rural community of Marlboro and how people choose to live in the mountains and forests often not out of need, but out of pleasure. Many of us have AirBnB housing where people from the cities come to stay with us for the same reasons – to enjoy some nature and live simple and free in the countryside. 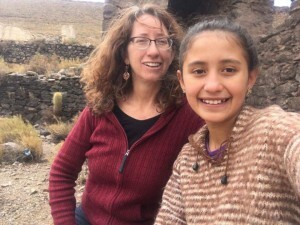 It seems this is part of what Bolivia is striving for in their Bien Vivir program, to get the recent city migrants to move back to the countryside using their city housing on occasions but having their home base being in the rural areas. With the rural areas equipped with the modern amenities of the cities – good schools, electricity, roads, health care, cell service and wifi. It does not sound very different from what we ask for in Vermont. 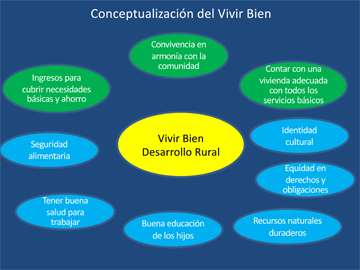 So far, the Vivir Bien program has not been so bold as to offer this “reverse migration” model. But many of the development workers I talk to express hope that in time, and with better and more stable quinoa prices, people will begin to realize what they have left behind and make that choice to have the healthy country lifestyle once again. As Ecebio pointed out, “the countryside is dirty, but the cities are contaminated,” – noting the difference in the quality of life in each place – with air and water pollution from unregulated industry and astronomical growth being real threats to the health of city dwellers. 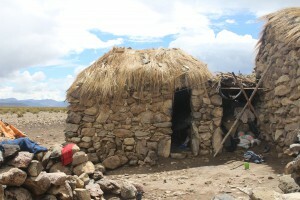 Traditional housing in the remote quinoa lands. The 1970s was the time of the agriculture revolution in the development world with mechanized, chemical farming of massive acreages producing high yields of carefully developed crop varieties. Quinoa was not overlooked in this period as hundreds of thousands of development dollars poured into the quinoa region to help develop this ancient grain for commercial use. It was certainly a time of trial and error for the region – a place with delicate, volcanic soils, little rainfall and minimal organic material for building soil strength (nutrients). 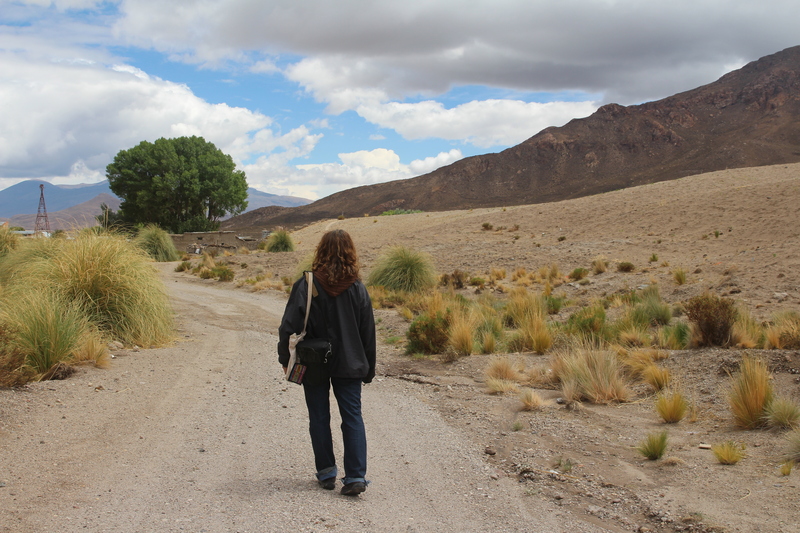 The vast, isolated quinoa landscape and llama. Farmers tell tales of foreign agronomics arriving with different fertilizers, pesticides and industrialized farming methods – each time being “outsmarted” in the long run by the native wisdom and organic farming techniques of the ancestors. Miguel Huyallas tells of the Dutch development worker who in the 1980s came with urea and other processed fertilizers for the quinoa farmers. Miguel challenged him to a quinoa growing “contest” and offered a piece of his land to the Dutch agronomist. The first year, the Dutch’s quinoa grew better than Miguel’s – larger, taller, with higher yields. However by the second year, the Dutch’s soils were already exhausted and his quinoa produced much less than Miguel’s organic quinoa fed with organic llama manure. The agronomist explained Miguel, never returned after that. There are patches of desert land where nothing grows, explains a Bolivian agronomist in Salinas. The soils, he says, are burnt by the rigorous use of chemical fertilizers by USAID projects which did not take into account the slower decomposition of matter in arid environments and the lesser amounts of carbon in the volcanic soils. Gladys of Chuvica talks of the pesticides which were used in abundance in 1970s development projects in her community. She explains how the people did not have proper training in applying and caring for them, often saturating their skin and breathing in the fumes. 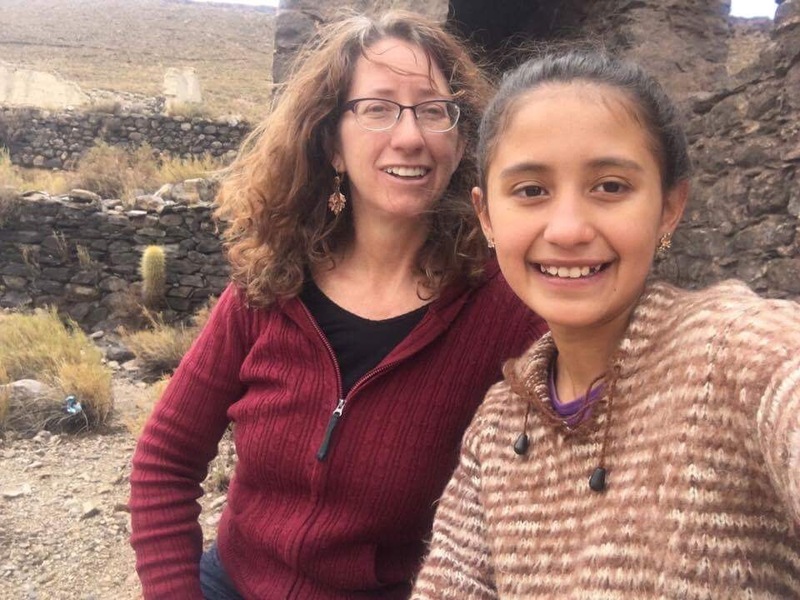 She attributes her mother’s early death at 50 to poisoning from the pesticides and believes there is a high rate of undocumented cancers in her region because of this. The other day a woman farmer in Quillacas told me how once when she was hand fumigating her crop, the backpack style tank that is filled with pesticides leaked all over her clothes and through to her skin before she realized there was a leak in the tank. The farmers do not want to fumigate. They understand the dangers of the chemicals and no one I have visited in the highlands is using chemical fertilizers in their production. The quinoa fields of Otuyo, Salinas. 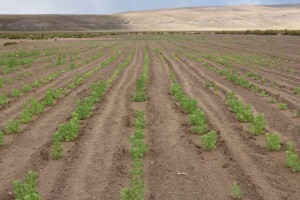 Never-the-less, development progressed and through decades of trial and error, an export quality, semi-industrialized quinoa industry was developed. The first quinoa producers’ association ANAPQUI was founded in the 1980s. France helped finance the association’s presence in international trade shows in the 1990s – helping to build awareness and markets for the tiny seed. 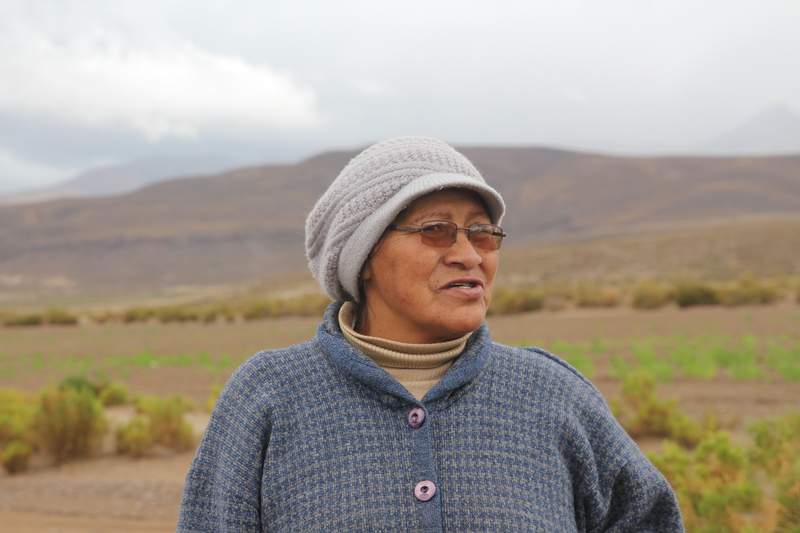 Belgium helped fund the first tractors being used in quinoa production through CECOAT, a Bolivian NGO, revolutionizing how the tiny hand-grown mountain grain was produced. Tractors cannot function on the traditional mountainside fields of the quinoa, so a valley method of production was created on the flat plains of the salt flats, opening up hundreds of thousands of acres of new land for quinoa production. 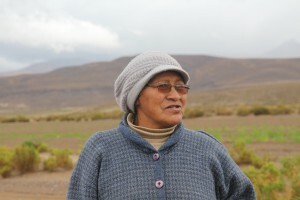 According to long time quinoa agronomist, Genaro Aroni, by 2014 Bolivia’s quinoa industry reached $200 million a year in sales with over 60 businesses worldwide grappling for access to the Bolivian “grain of gold,” and what the United Nations termed the high protein super food for the future of mankind. The development came at a cost though. Aroni estimated that by 2016 there were over 2,000 tractors tearing up the delicate soils of the altiplanos plains. With the recent drop in quinoa prices however, farmers are no longer planting the 30 to 60 acre lots they once managed opting for 21 acre plantings instead and are seeking to sell their tractors. Worse though are the thousands of acres of desert lands now left fallow. The slow growing tola plants and pampa grasses have been removed leaving the land to dry and soils to be carried away by the wind. 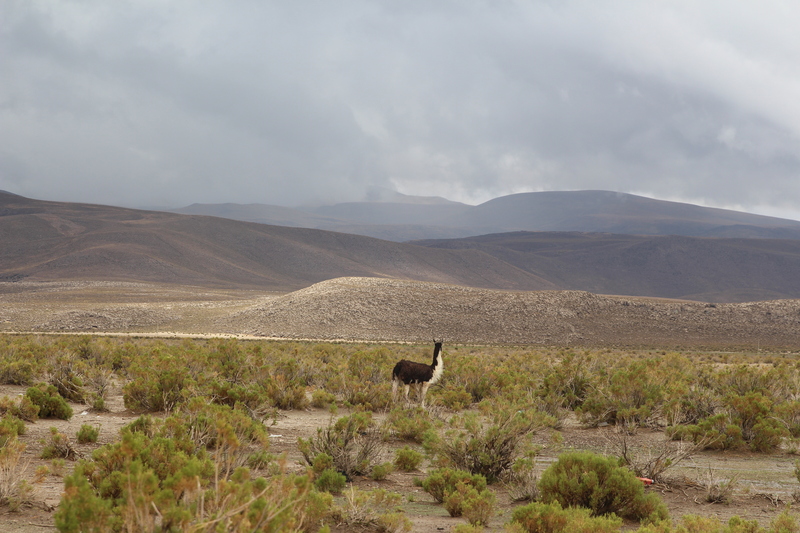 Worse, there is no longer forage for the llamas and wild vicunas which once dominated Bolivia’s vast plains. Projects to “reforest” the plains with tola plant seedlings are underway but it’s a long, slow process. In addition, with the new lowland farming of quinoa, new insects arrived which were never present before – including a moth whose larvae eat the immature quinoa seed heads. This has proven to be a huge challenge for farmers who value organic production and ancestral knowledge. Never had these insects been present before, so there was no ancestral knowledge to pull from. Over the years both conventional and organic pesticides have been used to fight the “worms” as they are called locally, but with mixed results. The conventional pesticides such as cyprometherine work but ruin the organic certification of the seed while organic pesticides are still in an experimental stage and not very efficient. 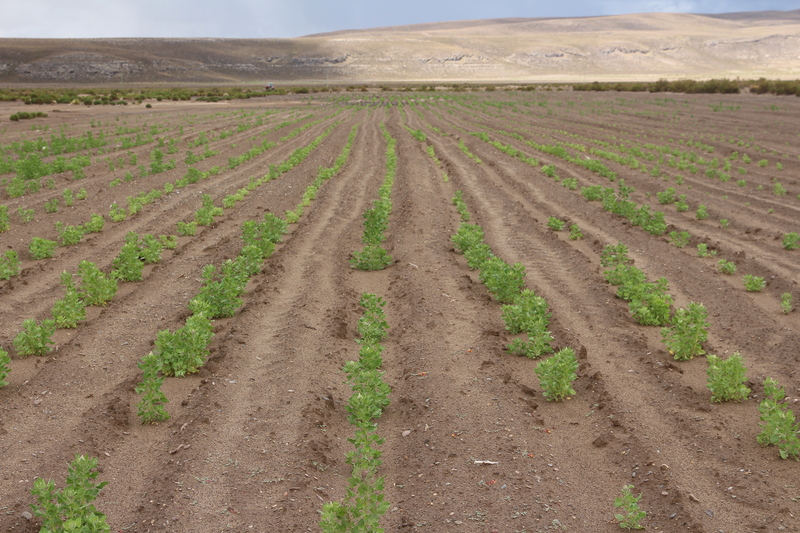 Perhaps the most knowledgeable in the recent history of quinoa development is agronomist Aroni. A quinoa grower himself from the Uyuni region, he’s spent 30 years on the quinoa development largely working with Proimpa, a Bolivian NGO whose mission is to, “Promote the conservation and sustainable use of natural resources, sovereignty and food security, and the competitiveness of agricultural products for the benefit of producers, the agricultural sector and society as a whole; Through research and technological innovation.” Many of Proimpa’s programs and come from collaboration with the Collaborative Crops Research Program (CCRP) funded by the McKnight Foundation. A recent example of a McKnight funded collaboration is the development of pheromone traps with Dutch academics. The traps which each contain 10 different pheromones, attract male moths to prevent them from fertilizing the eggs of the female moths. The moth larvae, a caterpillar, eats the valuable quinoa seed heads before they are formed causing thousands of dollars of damage and lost production. This year is the first time the traps were put into use and farmers reported satisfaction with how the traps worked – noticing a substantial reduction in the number of caterpillars they were finding on their quinoa plants. Aranoi speaks of the needs of the farmers in the areas of more funding for organic pest control systems and more investment into improving the delicate soils. He is currently working with integrative systems where quinoa is intercropped with native grasses that hold down the soil and add much needed organic matter and nutrients to the soil. One such plant is the k’ela, a wild leguminous tarhui that is a nitrogen fixer and can also be foraged by animals. 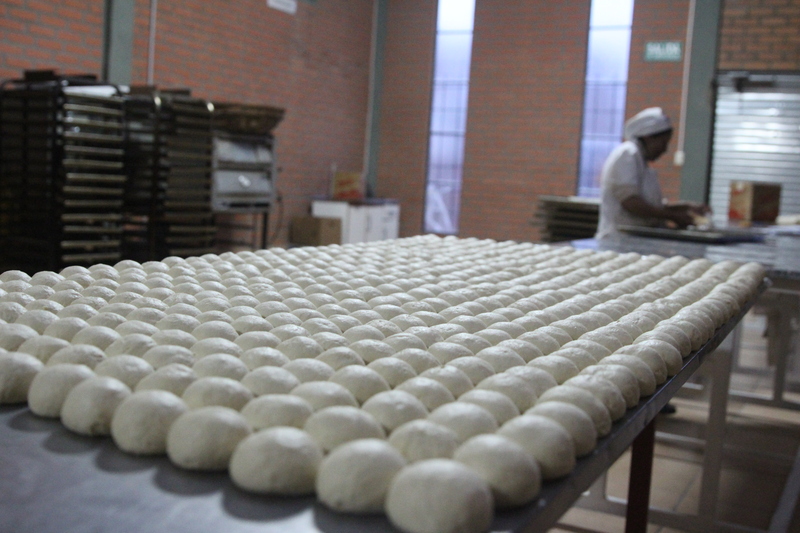 As far as the future of quinoa, Aroni sees more diversification in production being key for the people in the quinoa region. 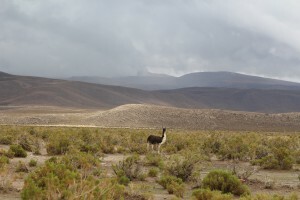 Traditionally quinoa was grown in balance with llama production with both industries complimenting each other – the llamas provided manure and transportation for the quinoa and food for the families and the quinoa stalks and 2nd quality seeds provided supplemental food for the llama. Now llamas and quinoa are often managed separately and the sizes of the herds have not kept up with the quinoa growth. 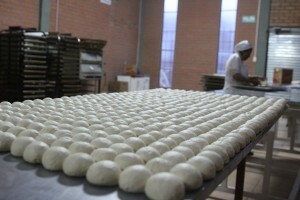 In addition, there is not as developed of a market for llama meat, especially in the international arena. Bolivia’s low fat, high protein, free range, organic llama meat is naturally low in cholesterol and is an excellent protein source. Aroni sees the development of the llama industry as a way for quinoa farmers to move forward in their economic development and well-being. 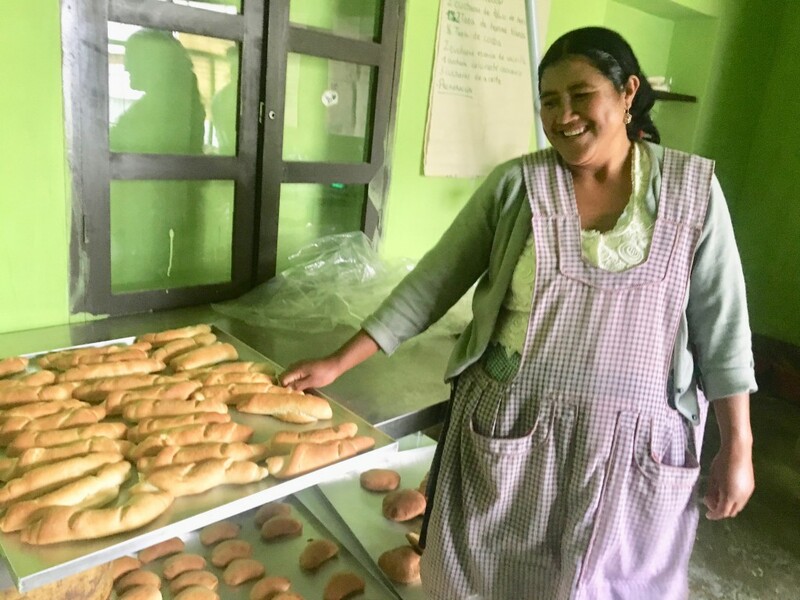 He also sees the development of effective organic pest control systems and a clear, transparent, realistic pricing system for the quinoa as key to the sustainability of this industry in Bolivia. 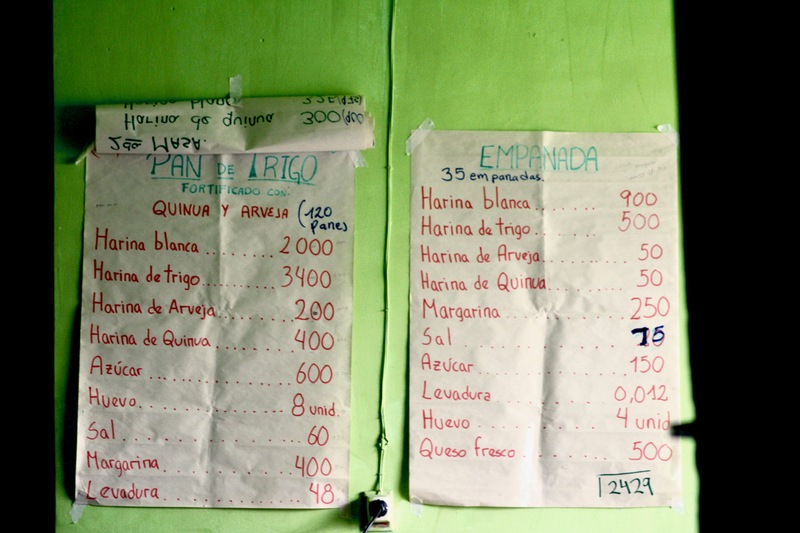 A sustainable price for quinoa producers? 800Bs a quintal – the same price that farmers themselves have been asking for from all across the salt flats.